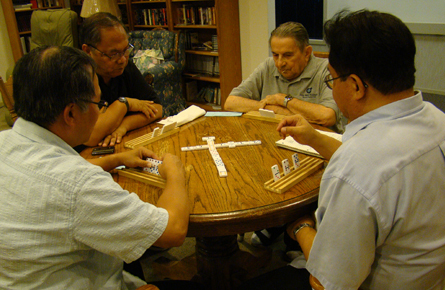 The Riverside residence serves as home to both retired and active Divine Word Missionaries. The location has a rich history going back to Native Americans. It was part of a large La Sierra land grant. The stone house at the center of the property was built in 1924. It became the first chapel, dinning area and faculty residence when the minor seminary began in 1964. The first building was Joseph’s Hall which served as sleeping quarters and classrooms. The larger seminary building was constructed in 1967. The new residence building was completed in 1998. It offers 18 private rooms, a chapel, dining room and recreation area. Along with serving our retired members, it also is the base for members who are active in some of the special ministries of the Province. This is the location of the provincial offices, the Vietnamese Charitable Association, and the retreat program. The residence is where the province members gather for Society business, celebrations and retreats. Visitors are welcome to attend the weekday and Sunday Masses.